Finally, February 23, the big Day! The new Safety Science office was inaugurated in the presence of Mr. Ohashi of Maxco Europe and Simon Ashley of Lighthouse UK. 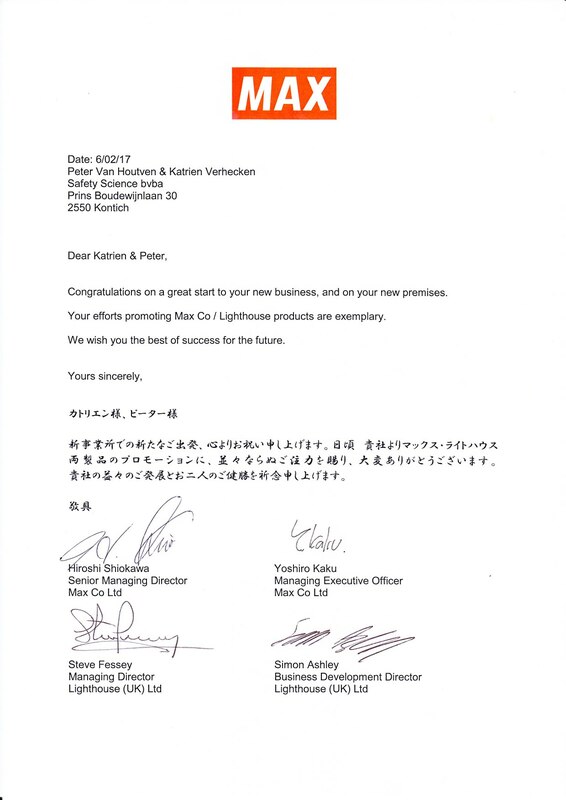 The congratulations and recognition we received directly from the management board of Maxco Japan and Lighthouse UK have given us great pleasure. They are an encouragement for us to work even harder in the future, as Premier Dealer of the Lighthouse printers in Belgium. The card with personal congratulations from all Lighthouse staff has touched us. It confirms Lighthouse’s involvement as an entire team, not only in the UK but also in Belgium and Europe. We would like to thank Lighthouse and Maxco for their continuous support and help, building together the Safety Science success story, but also for the opportunities we receive to grow our business so quickly. Thank you for your visit !